As a part of a major expansion project Bricesco Limited are pleased to be awarded the contract for the supply of repeat design Electric Kilns for the production of investment castings for one of the world’s leading manufacturers of Turbine Airfoils. Having completed the original £1 million contract for a range of Fabrications and Steel Infrastructure equipment for the prestigious ‘Crossrail’ project ahead of schedule, Bricesco have secured the order for the supply of repeat items to meet the requirements of ATC JV, ( a joint venture company formed by Alstom, TSO and Costain,) main contractor for the C610 Crossrail Systemwide Main Works. Bricesco Limited is proud to have been selected to Manufacture, Install and Commission a repeat installation for Derbyshire based DSF Refractories & Minerals Ltd.
ATC JV, a joint venture company formed by Alstom, TSO and Costain, main contractor for the C610 Crossrail Systemwide Main Works, have awarded Bricesco a major contract to supply a range of Fabrications and Steel Infrastructure equipment for the prestigious ‘Crossrail’ project. Bricesco is proud to demonstrate its expertise in supplying high quality, time critical components to CE Execution Class 3 for a world leading engineering project. Repeat Partnership business proves Quality & Reliability. Bricesco conclude further repeat business with Metallurgic Heat Treatment company for ONE Fixed Hearth Batch Furnace, to be integrated together with previously supplied equipment. 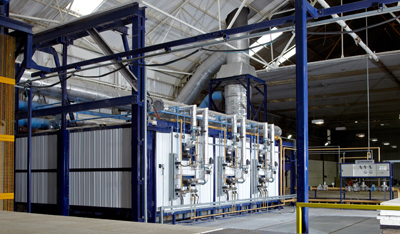 Guaranteed Quality derived from Bricesco policy to source materials and equipment exclusively from within UK and EU , with complete UK build and assembly was the deciding factor in leading Cairo based Heat Treatment company placing contract for £250k Rotary Furnace as a part of its expansion contract with Bricesco. As a part of Expansion Project for Ecosteel ( Scotland ) Ltd, leading bespoke Metallurgical Heat Treatment Service suppliers to the Oil & Gas Industry, Bricesco will be supplying the design, manufacture, installation and commissioning of 3 x Bricesco Furnaces, 2 x Bricesco Quench Tanks, Automated Charging Machine and Ancillary Equipment. Bricesco are proud to announce certification to provide CE Marking now Mandatory for Structural Steelwork. The directors of Bricesco are delighted to announce the successful certification of the Factory Production Control in conformity to BS EN1090-1:2009+A1:2011 in compliance with Regulation 305/2011/EU. The certification applies to Structural components/structures in Steel and structural components/structures in aluminium for load bearing structures up to and including Execution Class 4 in accordance with BS EN1090-2:2008+A1:2011 & BS EN1090-3+A1:2011 respectively. Bricesco obtain contract for new lift off hood heat treatment furnace as a part of Expansion Project for British Precision Engineering company.